The curly character wig can be used to create a number of different characters including biblical, English and French nobility, and pop stars. 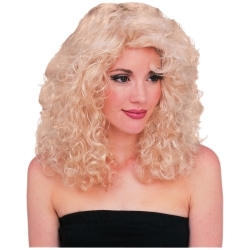 Shoulder length curly wig available in blonde. The wig features an elastic band for a comfortable and secure fit to almost any head size.